Hall of Famer Kirby Puckett was diminutive in stature, but made a large impression on collectors during his time with the Minnesota Twins. The following list covers his entire career and includes ten of the best Kirby Puckett cards that should be in your baseball collection. 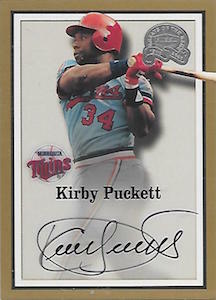 Shop for Kirby Puckett Cards on eBay. 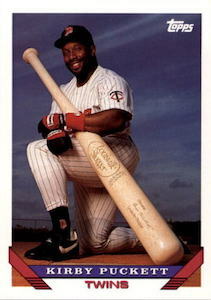 Despite having a career limited to just 12 years due to the loss of vision in his right eye, Kirby Puckett made the most of his time by averaging almost 20 home runs, 40 doubles, and 100 RBI each season, as well as maintaining a batting average above .300 and playing Gold Glove-caliber defense in center field. Puckett's career numbers never reached some of the benchmark Hall of Fame statistics that guarantee a player's entrance into Cooperstown, but his impact on baseball can best be measured by the two World Series titles he helped the Twins win during the 1987 and 1991 seasons. The entirety of Kirby Puckett's career was played during the junk wax era, but many of his cards are amongst the best that the time period had to offer collectors, and is further evidenced by his ongoing popularity and inclusion in modern products. Starting with his rookie releases in 1984 and 1985, Kirby Puckett cards have continually provided collectors with the opportunity to collect a fun and exciting player, both on the field and on cardboard. This top ten list of his cards provides collectors with a wide variety of options, ranging from popular base cards, that can be easy and inexpensive to acquire, to cards that will provide a great challenge to experienced collectors. Click on the images or listing to shop for cards on eBay. The 1993 Topps set might be mostly known for Derek Jeter's rookie card, but one of the best base cards in the set belongs to Kirby Puckett. 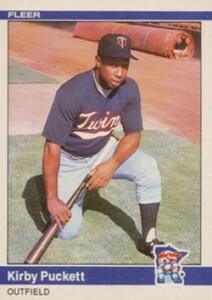 A little reminiscent of the 1985 Fleer Mickey Hatcher card, which had a picture of the Twins infielder wearing a giant glove, this gem shows Puckett posing with a giant Louisville Slugger bat. Obviously, the combination of Twins players and giant sporting equipment is a winning formula. While this base card of Kirby Puckett is an easy find and is light on the wallet, it remains a favorite with collectors. 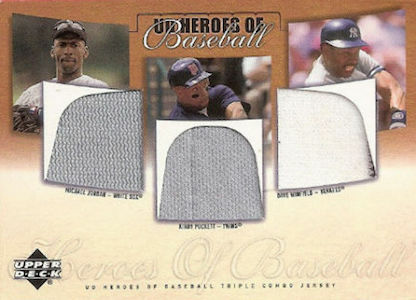 Although they emerged in the 1990s, Kirby Puckett did not get his first relic card until the 2001 products started to hit shelves. There were several different relics of the Twins Hall of Famer released that year, but one of his more popular cards has been this great-looking Upper Deck relic from Prospect Premieres. The combination of Puckett, a Twins star, and Dave Winfield, who starred as a baseball, football, and basketball player at the University of Minnesota, makes this a popular card for collectors in the Twin Cities. Throw in Michael Jordan, because he's Michael Jordan, and this is a cool triple-relic card. Score ran the Dream Team subset for several years in their early 1990s card sets, which gave collectors some memorable cards to add to their collections. 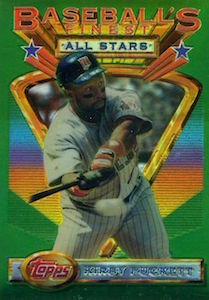 The 1991 Dream Team cards featured black-and-white photographs of several star players, including Kirby Puckett. While Kirby was a fabulously talented baseball player, his physique did not seem to fit the mold of the typical star baseball player. At just 5'8", with a stocky build, Puckett defied the stereotypes of what a star athlete should look like. One of the great sets of the early 1990s, 1993 Topps Finest offered collectors a chance to chase down high-end cards of their favorite players. The difficult-to-find Refractor parallels are definitely the highlight of Topps' venture into the world of premium baseball cards. Graded and raw copies of the Puckett refractor are some of the most sought-after cards by collectors of the former Twins great. 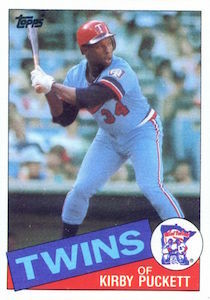 Kirby Puckett's first Donruss card appeared in the company's 1985 set. The card features a nice portrait-style photograph of the outfielder, but the dark edges of the card have made this Puckett rookie condition-sensitive and popular with fans of graded cards. Chipping around the card's edges and centering are the primary issues to watch for when looking for one of these Donruss rookie cards. The 1985 Topps set took off in popularity, and in price, during the late 1990s based on the home run exploits of Mark McGwire and the success of Roger Clemens with the Yankees and Astros. 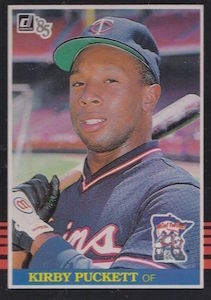 However, many collectors forgot about the Kirby Puckett rookie in the set, which is one of the more underrated cards from that era. While Puckett has several rookie cards to choose from, this action shot featuring Kirby wearing the polyester road-blue Twins uniform deserves a little bit more recognition. There is also a Tiffany parallel that commands large sums in high grade and an OPC edition. The 2000 Fleer Greats of the Game autograph was not Puckett's first certified signature card, but it is still one of his most popular cards with collectors. Fleer did a great job with the design that featured a simple gold border, a color picture of the player centered on the card, and the team logo and player name a third of the way up from the bottom of the card. The space at the bottom of the card provided a great place for players to sign the cards. The Puckett card features his usual quality signature, but the card was short printed which limited the quantity and increased the demand and price for this card. The rarest Puckett card on the list comes from his stop in the California League during the summer of 1983. The set was produced by Larry Fritsch, who besides being one of the greatest super collectors ever, also produced minor league sets throughout the 1980s. 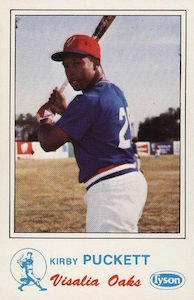 While most of his minor league sets were focused on players and teams in the Midwest League, this Kirby Puckett card is considered one of Fritsch's finest cards. Collectors tracking down this Kirby Puckett card should be prepared to pay top dollar. The Leaf Signature set introduced mainstream baseball card collectors to the per-pack autograph product. For $9.99, collectors could open a pack of cards and be guaranteed a signed card. While the majority of players in the set signed 5,000 cards, several of the star players in Leaf Signature only signed 1,000 cards, including Puckett. 1,000 copies might seem like a high number for current collectors, but it was a limited amount for that era. 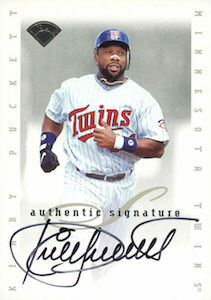 The Kirby Puckett autograph has remained one of the more popular autographs in the set and many of the cards have found their way into collections they are not likely to leave. This was the first certified autograph of Puckett and certainly carries a premium in terms of price and availability. The 1984 Fleer Update Kirby Puckett card is one of the best rookie cards from the 1980s. It has long been desired by collectors and has remained extremely popular more than 30 years after it was released. This card was initially offered to collectors as a part of a box set and many collectors opened their sets for the rookie cards of Kirby Puckett and Roger Clemens. While there are still raw copies available to collectors, this card has become one of the most popular graded cards on the market and a must-own for baseball card collectors. I purchased a pack of BB cards at a $ store and we had a Kirby Puckett. Could this be the real thing? How can we tell?